All the Great Dipper replacement lenses are professionally crafted to precisely fit into your original Oakley sunglasses frame. * 1 pair Replacement Lenses - Sunglass frame is not included. * 1pc Thank You Card with Polarization Test Piece ( It is FREE ) - Use the polarization test piece to test if your lenses are POLARIZED. * 1pc good quality black Microfiber Pouch ( It is FREE ) - Use it to clean your lens or pack your sunglasses. * 1pc excellent Paper Lenses Box ( It is FREE ) - Lenses, card and pouch are put in this box, the box will protect them during delivering. Keep away from Salt Water and ONLY use a mild dish soap and water to clean when dirty. Dry with a clean microfiber cloth, DON'T use your shirt or finger. When you see the polarization test card by eyes directly, you can't see the hidden fish, but if you look through our polarized lens, fish appear! Great Dipper is a manufacturer and distributor of replacement sunglasses lens only and doesn't offer, market, or sell replica or counterfeit products. 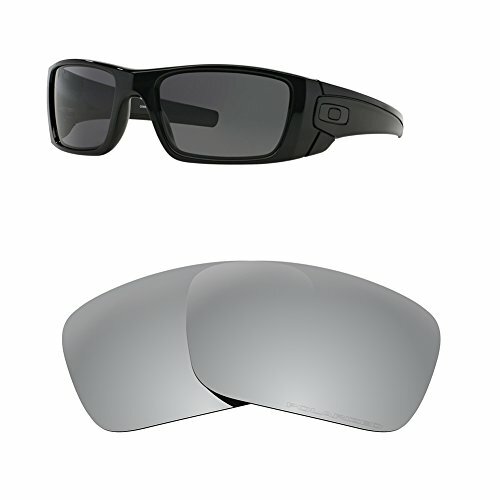 Great Dipper is not affiliated with Oakley or any other brands mentioned. ✔【WHAT YOU WILL GET?】 - 1 pair Replacement Lenses ( sunglasses frame is not included), 1pc FREE Thank You Card with Polarization Test Piece, 1pc FREE good quality black Microfiber Pouch, 1pc FREE excellent Paper Lenses Box. ✔【LENS COLOR & APPLICABLE】- Polarized advanced Silver Titanium Mirror, NOT matte. ***APPLICABLE: Best for medium to bright light conditions. Perfect for driving, baseball, tennis, football, soccer, water sports, and all other outdoor activities. Features a Mirror coating to reduce glare, especially useful for conditions of sand, water, snow, and higher altitudes. ✔【 SMOOTH LENS EDGE & PERFECT FIT】 - Lenses' edge is very smooth and will fit your frame securely, because we use automatic cutting machine and operate by professional technician who has more than 20 years experience in this industry ( Some of other companies use manual cutting machine, the lens edge is rough and not fit securely). ✔【THICKER LENS QUALITY & PASSED STANDARD】 - 1.5mm lens thickness, thicker lenses will fit better for your original brand sunglasses frames. ( 50% thicker than other company's ). ***Exceeds FDA Safety Standards, ANSI Z80.3 and EN 12312, AS/NZS 1067 Standards. ✔【POLARIZED ENGRAVED & 100% UV PROTECTION】- All the lenses come with engraved "POLARIZED" on the bottom left of the left lenses to authenticate our replacement lenses are indeed polarized lenses. All the lenses with 100% UV protection, reduce glare, enhance contrast, protects your eyes from the dangerous rays of the sun so your eyes stay safe. If you have any questions about this product by Great Dipper, contact us by completing and submitting the form below. If you are looking for a specif part number, please include it with your message.